Three Heart Surgeries Completed, Thanks to MEDRIX Donors! Three more lives have been saved, thanks to the generosity of MEDRIX donors! Congenital heart defects are some of the most common birth defects globally, but it can still be a struggle to receive the care needed in areas of Vietnam. Surgery continues to be expensive, even when families qualify for government assistance. Treks to the nearest hospital that can perform the surgery, can be long and arduous through hundreds of kilometers of heavily forested and unpaved roads. Families are expected to provide their own food for the child while in hospital, and also provide for themselves in the “Big City” of Hue. These obstacles to care are daunting, and are simply unmanageable for some families if they do not have support. MEDRIX is excited to have lifted those burdens for 3 families so far in 2017. Because of the support and donations of MEDRIX donors, three children will be able to grow up happy and healthy. They’ll be able to complete their education and have a promising future ahead of them, free of any heart health risks. Take a look at their pictures below. Thank you MEDRIX donors!! Nga is a very sweet and calm 5 1/2 year old girl from Quang Binh Province, one of the poorest provinces of Vietnam that relies heavily on agriculture. Nga’s family holds a “poor card”, a card that determines eligibility for government subsidies. But despite having a poor card, families still must come up with some of the money for health care costs: costs that rise after a child turns 6. Nga’s family was desperate to not only save their daughter’s life, but to secure surgery before her 6th birthday in June, when the cost would rise even more. 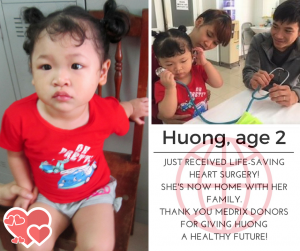 Thankfully, MEDRIX and several other nonprofit organizations were able to partner to sponsor little Nga’s heart surgery just in time for her to enroll in preschool. Her dad was tearing up talking with the MEDRIX team before the surgery, but Nga has been released from the hospital and is in good health! Tu is a 2 1/2 year old boy living with his parents, siblings and grandparents also in Quang Binh. His parents were very worried about their finances and their “poor card” status. Tu’s father was a fisherman and his mom was a fish broker, but lost their jobs when a steel mill disaster dumped waste into the ocean and caused a scandal. His father now works on a daily basis as a laborer, but the future is uncertain. 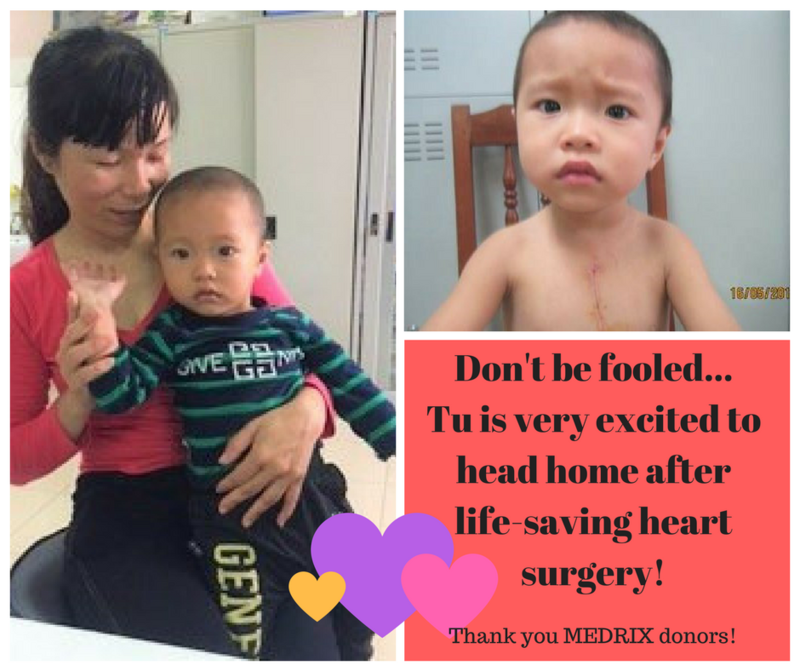 MEDRIX was very happy to support Tu and his family for life-saving heart surgery! Thank you, MEDRIX donors, for giving Tu a new chance at life! Little Huong is barely 2 years old and needing a slightly more complex heart surgery to correct her congenital defects. She is a very bubbly and active toddler who was accompanied by her loving parents. Huong and her family live in very rural and mountainous Nam Dong District, where MEDRIX has promoted community health programs since 2006. Life in Nam Dong is very difficult with a lack of material goods and necessities. 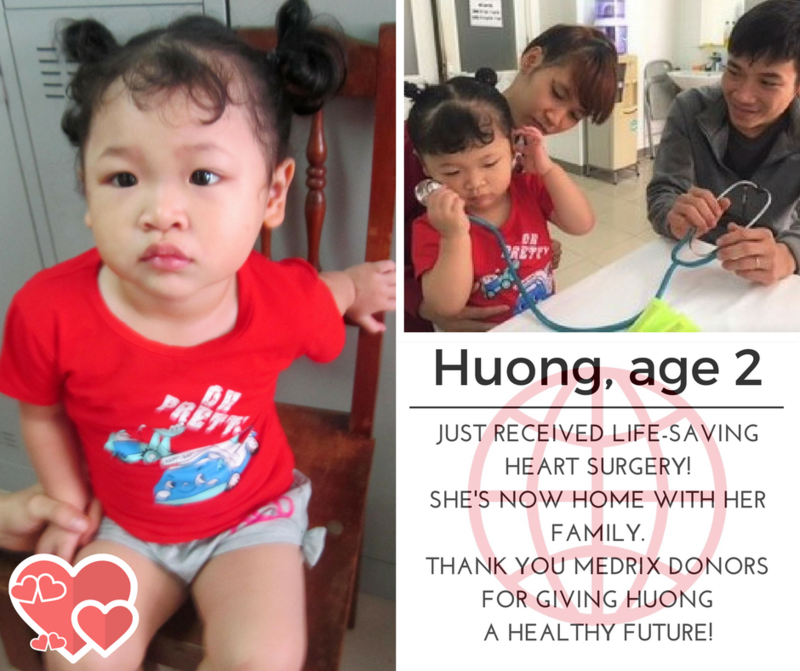 Huong’s father makes a very good living as a laborer compared to other families in Nam Dong, but Huong’s heart defects were more complex, making her surgery almost double of the other heart patients MEDRIX sponsored this year. 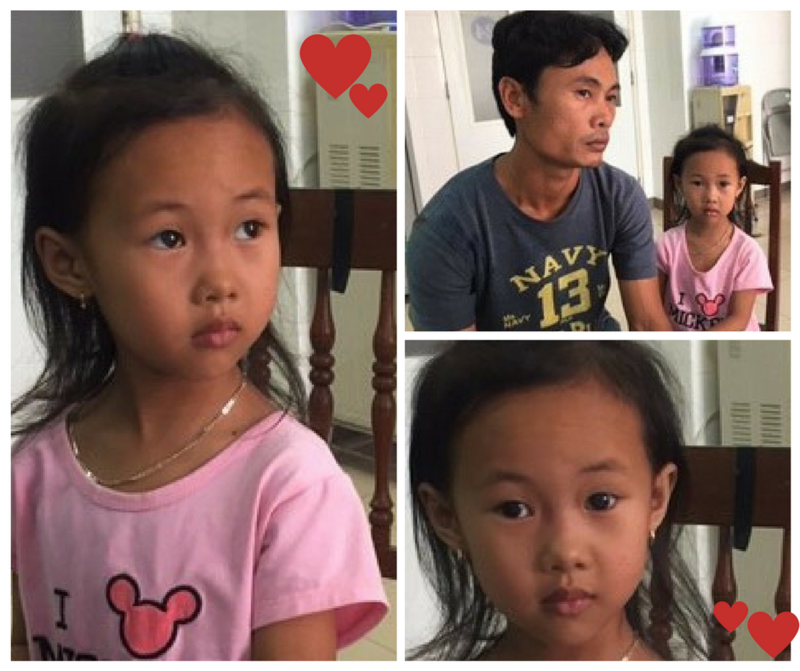 Luckily we were able to partner with a few other nonprofit organizations in Vietnam to help Huong’s family cover the cost of her surgery. She was just released last week and is doing very well! Thank you again to all of our supporters and donors that help change lives in Vietnam! Your generosity makes a big difference to many families, and we cannot thank you enough!